LUV2EMBOSS: Happy Valentine's Day ... Almost! 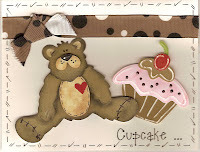 I've been busy creating Valentine Cards with my dear friend Julie, from Australia, and here's a peek. I've had fun combining L.I. templates with Cottage Cutz Dies. This bear is one of my favorites. Oh it's super Donna. You're a die cutter now too!! The bear is fun. So glad you have extra craft time with Julie this week. Lovely card. Hey Donna! This card is so cute!! I'm finally getting out my stencils back out!! I'm gonna have to check out all the new ones I've missed!